Check out this cool new driver tool from WORX. It looks like a pistol but in reality it's a small screw driver gun. The SD Semiautomatic driver can carry up to 6 different hex-shanked driver bits at any one time. So not only does it allow you to drive various screw head types, it also provides an integrated carrying case for the driver bits. It's an excellent screw gun for small projects around the home or apartment. Whether you need to hang up a picture, assemble a new piece of furniture, tighten up screws on a kitchen or bathroom cabinet, or do some light electrical/plumbing work, the WORX SD Semiautomatic driver is perfect for the job. The WORX Semiautomatic driver is lightweight and easy to use. Simply pull back the magazine cover and rotate the cartridge to the desired driver bit, close the magazine cover and it's ready to drive screws. It runs off a built-in rechargeable 4V Lithium-ion battery so there is no dangling wire to worry about when using it. The WORX WX254L SD Semi-Automatic Power Screw Driver with 12 Driving Bits costs $49.99 and you can find it at www.worx.com and at www.amazon.com. 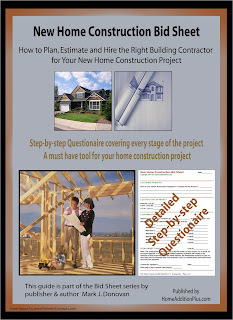 Before kicking off your new home construction or room addition project make sure to check out my home construction and remodeling checklist guides at HomeAdditionPlus.com. The “New Home Construction Bid Sheet” and “Room Addition Bid Sheet” will help to ensure you hire the right general contractor for your home construction project. In addition, they’ll help you through the planning process of your new home construction project. Moreover they’ll help you accurately estimate your new home construction costs or room addition costs so that you’ll know how much your construction project will really cost you. Having accurate construction costs up front will help with your project planning and financing efforts. 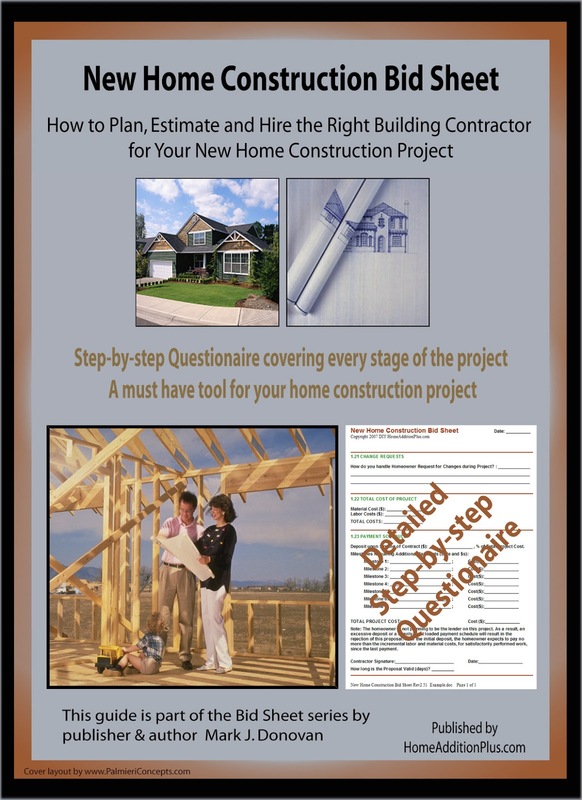 One of the key components in the “New Home Construction Bid Sheet” and “Room Addition Bid Sheet” is an extensive questionnaire that you provide to prospective general contractors to fill out. Once completed, you can make easy apples-to-apples comparisons of contractor quotes so that you can make a more informed and better decision on which general contractor to hire. The second major component in the “New Home Construction Bid Sheet” and “Room Addition Bid Sheet” is estimated home construction costs on a cost per square foot basis. It includes cost breakouts for all the various phases of the home construction or room addition project. Lastly the “New Home Construction Bid Sheet” and “Room Addition Bid Sheet” each contain a detailed section for the homeowner on how to interpret the general contractor questionnaire responses and the reasons for asking the questions. In addition to the “New Home Construction Bid Sheet” and “Room Addition Bid Sheet”, separate construction cost estimate Excel spreadsheets are provided to allow you to track predicted versus actual new home construction costs or room addition costs. So make sure to purchase the “New Home Construction Bid Sheet” or “Room Addition Bid Sheet" for your particular home construction project. I guarantee you they’ll save you time, hassles, and a small fortune in money. Also check out many of the other types of home remodeling and construction bid sheets at HomeAdditionPlus.com.